Director Erik Anjou and Frank London first began collaborating after they had been introduced by filmmaker Pearl Gluck. Frank was writing the musical score for Erik’s “A Cantor’s Tale,” the beloved documentary about Cantor Jack Mendelson. It seemed natural for Erik to start attending more and more Klezmatics shows. He was stunned by the depth and beauty of the band’s music, and the musicians’ ineffable resilience and courage. “Why isn’t anyone making a movie about these guys?” he asked. So began a four-years plus journey of researching, fundraising, journeying alongside the band, invading the members’ apartments and private lives, filming, editing, and then fundraising, filming and editing some more. 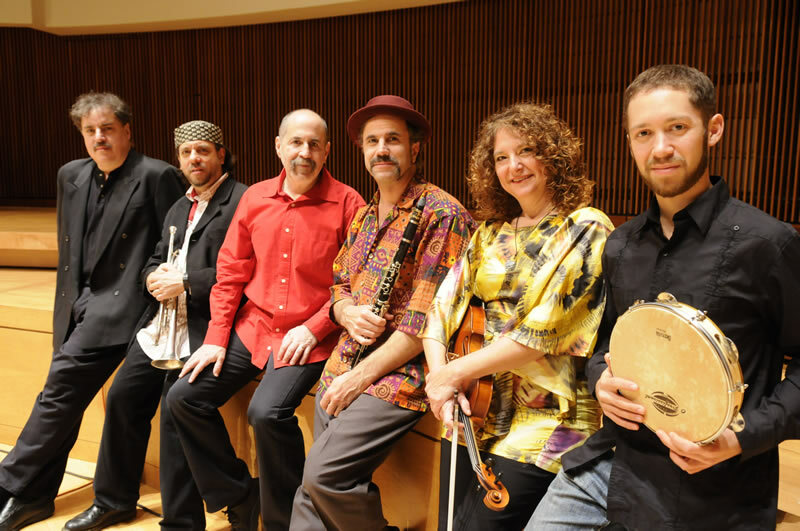 The Klezmatics are a wildy fascinating, talented, and unpredictable bunch and at a certain point, usually pretty early on, the documentary process becomes one of art imitating life. We went to YIVO Institute for Jewish Research with Lorin, a film scoring audition with Frank (he didn’t get the job), a musical poetry workshop at Mabou Mines with Lisa, a Paradox Trio rehearsal with Matt, and a Scandinavian dance class with Paul and his panoply of fiddles. We traveled to sub-zero Wisconsin alongside the Klezmatics and kosher-gospel dynamo, Joshua Nelson. We were alongside when the band played its 20th Anniversary Concert at The Town Hall. We were there in the Woody Guthrie recording sessions and in Ramat HaSharon, Israel with collaborator Chava Alberstein and in Sczczecin, Poland. We were there when they were nominated for the Grammy Award. And we were there when the train crashed in the Grammy’s wake, and the Klezmatics needed to figure out how to re-invigorate their thrilling and seminal musical adventure that was first born in 1986 in the East Village. The answer was close at hand. The music’s vision, and reward, are embedded in the very process of continuing to do the work itself, usually against formidable odds. “The Klezmatics: On Holy Ground” wrapped its post-production in April 2010, and was acquired for distribution by Seventh Art Releasing in Los Angeles. The documentary and band’s journey now continue anew. We look forward to seeing you on the road.